You read it right, it's not Dog Gone Good Whiskey, It's Dog-on Good Whiskey. That's a catchy little phrase. The logo that bore the slogan is just as catchy! As Paul Harvey used to say, many years ago, "Here's the rest of the story". 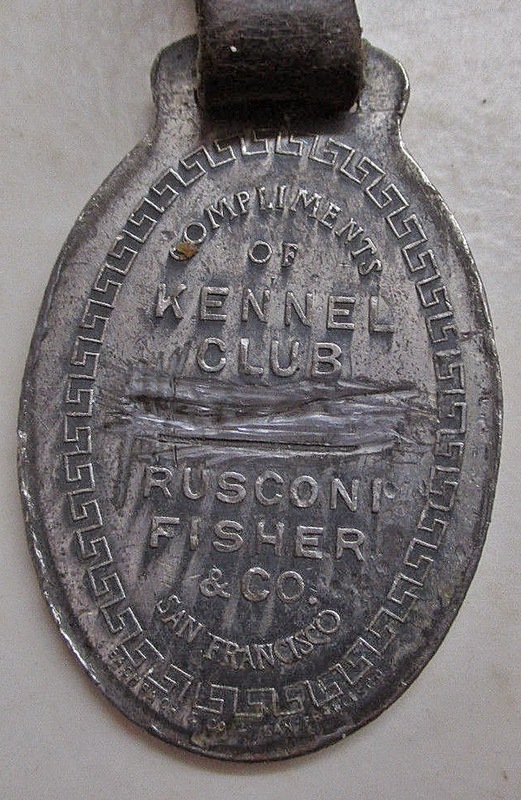 Rusconi & Fisher first appeared as a partnership in the 1898 San Francisco directory. For two years the newcomers kept a low profile, with only a small listing in the Crocker directory to advertise their existence. 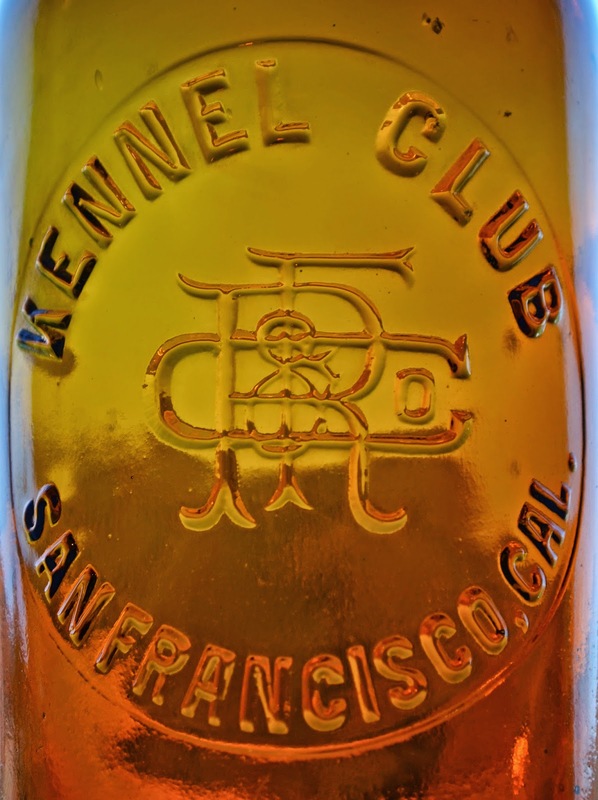 In the ensuing years, they became a power in the S. F. wholesale liquor market, no doubt due to the popularity of the Kennel Club brand, which they had sole agency of. 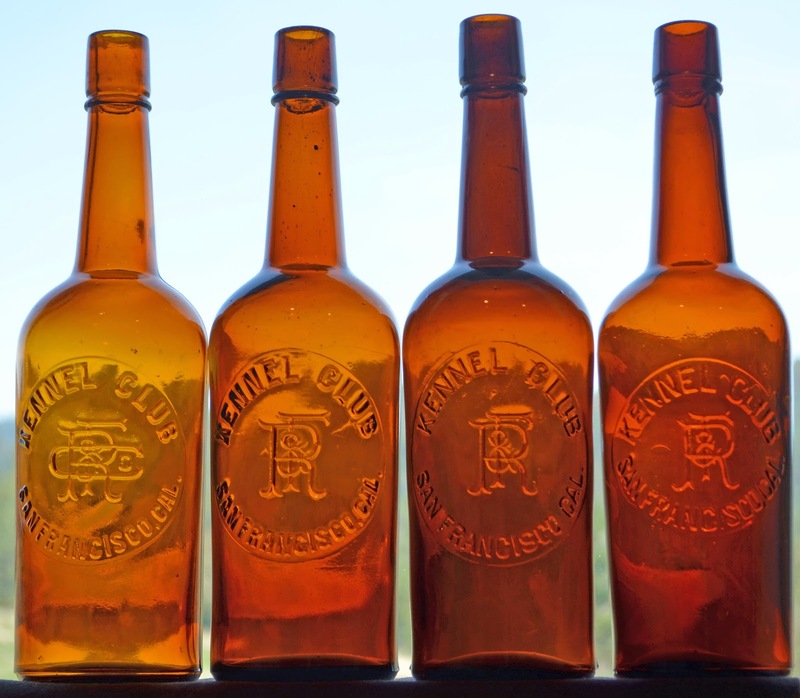 The brand was so successful that the glass works that produced the bottles for the product utilized no fewer than four different molds. 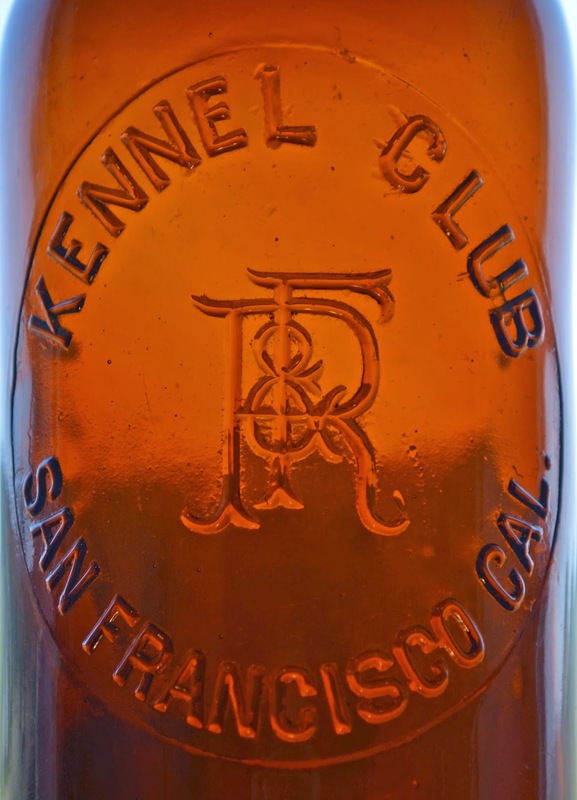 The first big push for the Kennel Club brand occurred in the Pacific Wine and Spirit Review of 1900. 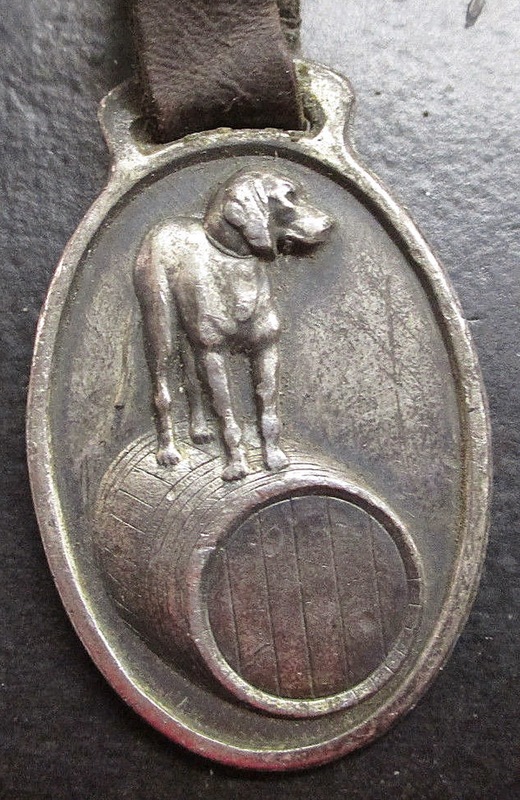 The dog (apparently some type of hound) became the mascot for Kennel Club whisky (note Ky and not Key), their flagship brand. The bottle on the far right in the lineup is quite obviously the earliest of the four variants. The first bottle has all the attributes of having been blown by an eastern firm. The mold is amateurish in appearance, and the bottle is notably cruder than the other three. The slug plate is oblong in appearance and the lettering does not resemble anything we are accustomed to seeing on western produced fifths. The tooling of the top does not resemble western techniques and the base mark is an oddball. It has three numbers contained within a drawn out diamond shape. It's the bottle on the far right, and is under a fifth, but more than a sixth, in capacity. The next bottle (2nd from right) is slightly larger, has a smooth base (no basemark) and has embossing which looks very much western in appearance. It is heavily air vented and the embossing is crisp and well executed. This mold, and the ensuing bottles blown in it, were no doubt, a product of the San Francisco and Pacific Glass Works (SFPGW). The next bottle (3rd from the right - 2nd from the left) is a no brainer when it comes to dating. 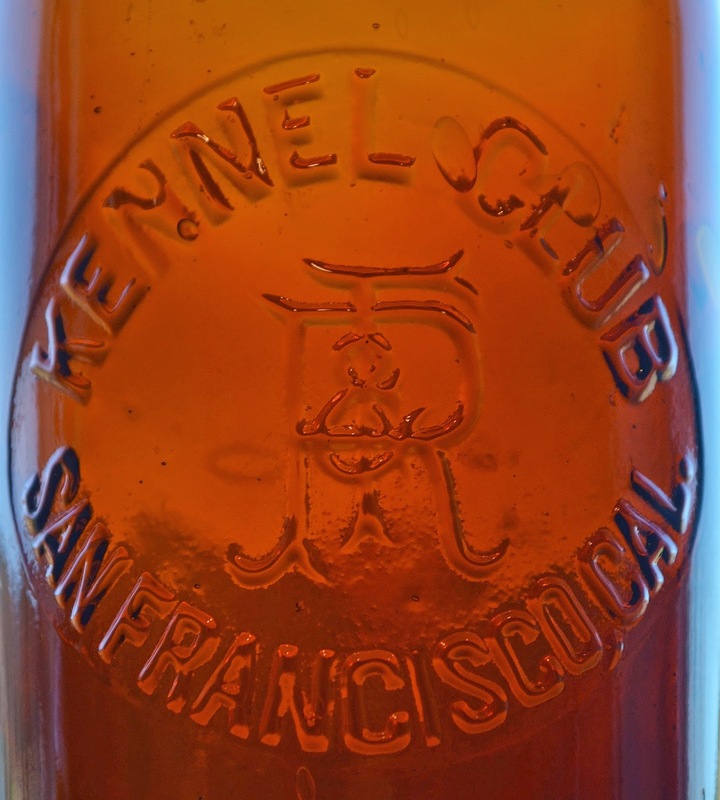 The base mark is 32H, which attributes the bottle to Abramson Heunisch Glass Works of San Francisco. Abramson Heunisch were the successors to the "SFPGW". The base mark dates the mold to ca. 1900, when the firm opened their new glass works at the corner of 15th and Folsom in San Francisco. The H base marks ran in numerical sequence, starting in 1900. This mold was used from 1900 - 1906, when the firm was temporarily incapacitated by the Great Earthquake & Fire. 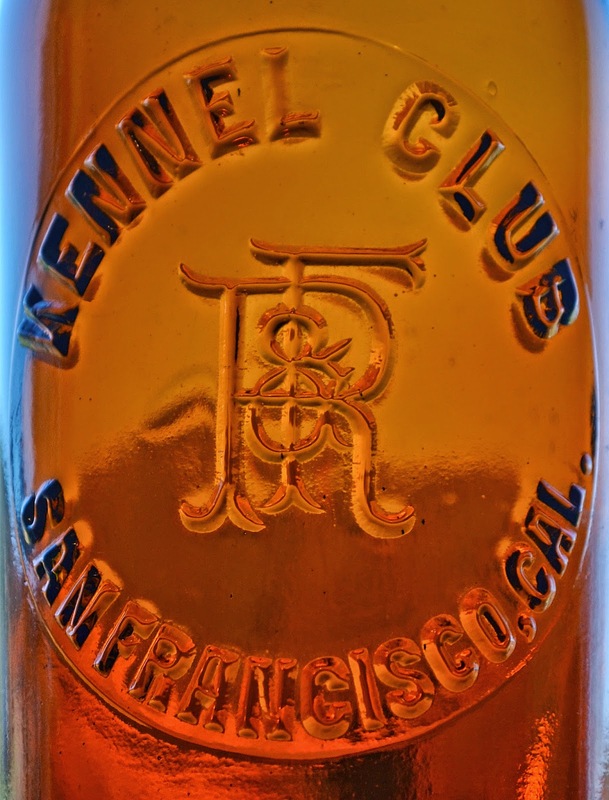 In 1907, the firm name was changed to Rusconi, Fisher & Co. A new ad campaign was embarked upon (pun intended) and the hound was now pictured perched atop of a hogshead of Kennel Club. commissioned a watch fob and an etched shot glass to help with the brands visibility. 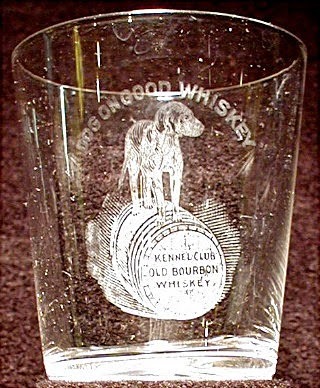 Note that the spelling of Whiskey on the shot glass - "Key", indicating that it was now distilled, blended and rectified in S. F., as opposed to Kentucky (Ky). This variant is the bottle on the far left of the lineup, and is the last of the series of cylinder fifth molds blown for Rusconi Fisher. It has "& Co." added to the embossing pattern. This bottle utilizes the same base and rear half mold as the middle bottle, which as noted before dates to ca. 1900 - 1906. A new front half mold was cut and exchanged for the earlier one which was sans "& Co.". This mold was the last cylinder used. Around 1910 the rectangular Full Quart became the standard. 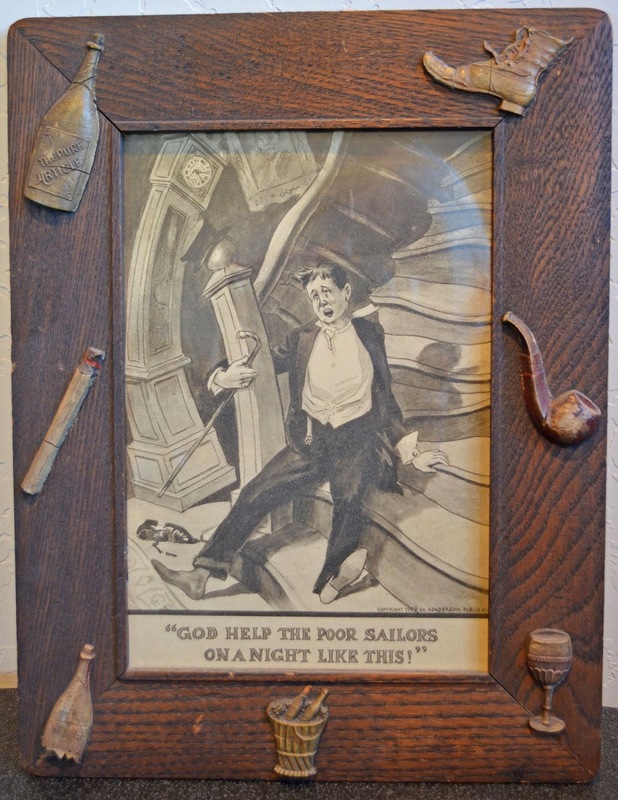 A mold was cut for the "tanker", (Barnett #708), embossed simply Rusconi Fisher & Co. San Francisco". The reverse of the tanker no doubt sported labels for Kennel Club, as well as the other brands that the company sold. This bottle was utilized until 1917, when the company shut it doors for good. Quite the run; 19 years in business. Yep, that's a Dog on Good run! Whether your New Years Eve was like this! 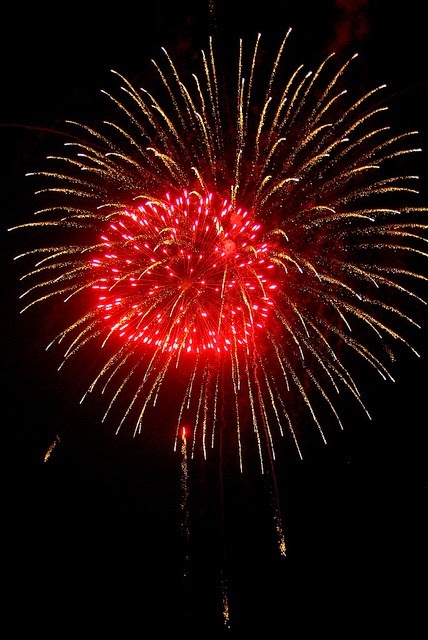 Western Whiskey Gazette wishes one and all nothing but the best in 2015.